1) TTs are easy to enter, safer than all other cycling competitions and the only “pressure” is to achieve your own satisfaction: improvement at each distance on the same or different courses – through to winning prizes (Fastest Time placings or on Handicap / VTTA Standard Times or on Age Category placings). 2) Novices should gain some endurance by riding our Clubruns / Reliabilities / Chaingangs. Then you might try training rides / workouts on your race bike (more below), starting at the shortest standard distance of 10 miles and then building up to 25 miles and beyond (if you have the time and the motivation). It is recommended that you record rides showing route details, conditions, distance, time and average speed for the whole route, plus speed for certain sections to compare with past and future rides. 3) You should get a bike computer to record average speed over a certain stretch of road or the whole ride. Experiment to ascertain what your preferred warm-up distance and speed should be. Say, you can average 18 mph on your test ride, then you may be able to increase this to 20 mph in racing mode. “20 mph” is (or was) known as “evens” – the target speed for every “racer”. 4) Most events are for Solos and Tandems (including mixed gender). There are special events for Trikes / Tandem Trikes and also for Teams of 2-, 3- and 4 riders. Entry Fees vary between £4 for members at our Club Events (of which £3 has to be paid to CTT) and £8 to £10 for shorter Open Events, depending on the total prize values. The standard Entry Form can be downloaded from the CTT website and postal (or sometimes Internet Entries) are accepted by organisers at least 2 weeks before event date. For club events, just turn up at the HQ location at least 20 minutes before the start time to sign on, get a number, warm-up and queue at the start by the event start time + your number – 3 minutes. 5) As you progress, you may try an “aero position”, by fitting “TT or TRI-bars” onto your road bike, which will increase your average speed by 1 to 2 mph. To achieve an optimum position, it will be necessary to move your saddle forward and also to raise it slightly. CTT (UK) and UCI (World) governing bodies have regulations regarding these settings. 6) Congleton is one of the best locations for Time Trialling. On summer Tuesday evenings, we have our own weekly TT’s on 6 local courses (plus 2 Hilly / Hill Climb). There are Open Events every weekend (usually Saturday) from 10 to 100 miles on local courses, which are coded “J” (including Hill Climbs and Hilly TT’s). All but two of the J-course HQs (changing rooms / refreshments) are within 11 miles of Congleton – and even closer to Holmes Chapel, Middlewich and Sandbach. Our fastest 25- and 50-mile courses are on the A50 near Uttoxeter, with HQ at Forsbrook / Blythe Bridge. 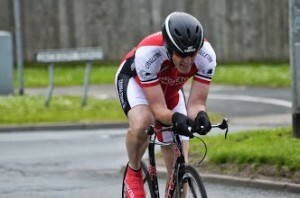 Our 12-hour TT has been moved to West Cheshire but is very popular as it is a counting event in the Local and National BAR (Best All-Rounder) Competition. The 24-hour event is also held in West Cheshire. Other courses within 1 -2 hour drive are coded A / D / K / L. Although courses are usually well signed and marshalled it is wise to ride each course (or sections thereof) in advance, in order to choose the optimum riding line so as to be safe at junctions and to avoid potholes. 7) The CTT Handbook (reference copy at the Club or buy copies at a discount from the treasurer) is a must-read for all Event details, Rules & Regulations, Course Details, History of Event Winners and Champions, etc. Why not plan your racing year as soon as the Handbook is available and list the chosen events on a spreadsheet? Open events on “fast courses” are often over-subscribed so you have to have a record of above-average performances on local courses before your entry will be accepted. 8) For open events, riders should wear their club clothing or plain clothing with short or long sleeves (not sleeveless Triathlon-style tops). Our club events are not very particular about the clothing regulations and the specific differences between CTT-legal bikes and Triathlon bikes (anything safe on roads will do). Riders are required to display their race number so that it can be seen by the timekeepers – which means put it very low down on your jersey to be visible from behind immediately after the finish line. Many members who are over 40 join the VTTA (Veterans Time Trial Association) and its local group, VTTA (Manchester & North West Group).